Harvey and I have been together for just under ten years and he has suffered more than average from various injuries and ailments, but the biggest problem was always his stiff and sensitive back. After owning him for four years I had accumulated four saddles, and, according to two saddle fitters, they all fitted him. Harvey disagreed. His behaviour varied from a series of small hops to full-on bucking bronco. Then I attended a demonstration where a horse without any known problems became even freer and better to ride in a Solution saddle. As soon as I could, I took Harvey to try one. Instantly he told me that it was right. 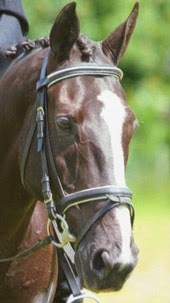 Several years later we haven’t looked back and I have both a Dressage and a Jump saddle from Solution Saddles. I never thought I would be able to ride him properly when he was having such problems, but now that he is 18 years old we’re enjoying more jumping and dressage than ever before. 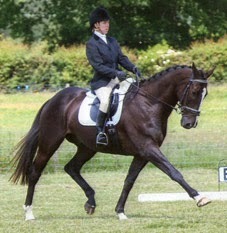 Recently a BD judge and trainer commented that he doesn’t move like an 18 year old horse. We have just returned from the BRC National championships in Lincoln where we were placed 6th in Medium, 9th in Elementary and 4th as a member of our Riding Club open dressage team.